Thank everything good and holy for kind neighbours! A huge thanks be to Wendy and Vern for letting us break and enter into your house in Lake Havasu City, AZ last night. We rolled the Rhino out onto the driveway for you, and if it is upside down at the bottom of the street when you get there, it happened after we left. They just don’t make emergency brakes like they used to. Havasu: a beautiful and apparently hot city (118 F in the summer), we will be back! And we will bring all our friends to this desert oasis. Its huge blue lake and river are surrounded by mountains and gorgeous college kids at spring break. And there’s a brewery. Yum. 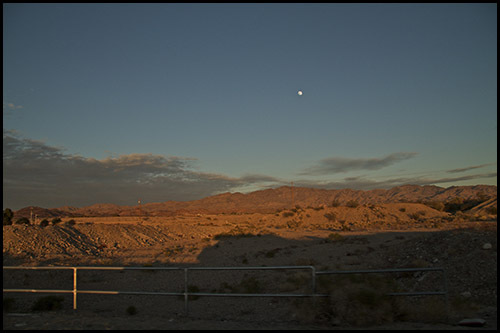 We left Havasu toward dusk, shot some photos in a restricted airport zone (the sign warned us we were on video surveillance—again). So much for trying not to draw special attention to Walter. We seem to sniff out trouble wherever we go even though we don’t go lookin’ for it. We hit a vehicle inspection stop, and here’s the thing, even though I get unwarranted heart palpitations whenever I see a uniform now (see humiliating US border patrol post two months ago), false alarms run rampant wherever we go. There’s three types of uniformed figures: police/troopers (intimidating and handsome), border patrol (young and handsome and a bit stern), and then there’s something I like to call the Orange Men (smiles and moustaches). The latter are agricultural inspectors. So when we pull up because pylons are preventing any other escape and I see a couple of oranges and a moustache, my heart skips a beat and then settles into normal rhythm again. We’re not in trouble. These guys won’t interrogate us about where we’re headed or what we’re doing and why we look so naive and gawky. All they want to know is: do you have any fruits or vegetables (that look or smell wily)? This we can answer. We have no trouble telling them, “yes officer, we have one orange and some wilted celery from Safeway”. They then tell us to have a great day and smile once more as we drive off into the sunset. We don’t have to worry that some blood thirsty drug dealer strapped a cocaine time bomb under our RV and those crazy K-9s will sniff it out and we’ll be sent to a new Guantanamo Bay even though we don’t even like drugs. We don’t have to worry that we might look suspicious perched inside a newer RV or that a nice little immigrant has stowed under our covers and is trying to travel all the way back to Canada with us (PS— I always look suspicious because my eyes get big when I get nervous and Canadian). Anyways, even though I have a withering psychological complex because of our initial crossing and that each time I see a patrol car, I wonder if I am speeding (we are always 10 miles under the limit). Or even when I see a nice police man buying coffee, I feel like I should have switched to decaf out of a sense of false guilt…. I will think about the Orange Men and their wonderful, warm smiles. They make the world a better place, one vegetable at a time. PS—Border patrol, if you are happening to read this blog— we like you too, even if you make us pee our pants with Canadian fear.